This is the east ridge of Hudson Bay Mountain, just outside of Smithers, BC (54° 47' N, 127° 10' W). 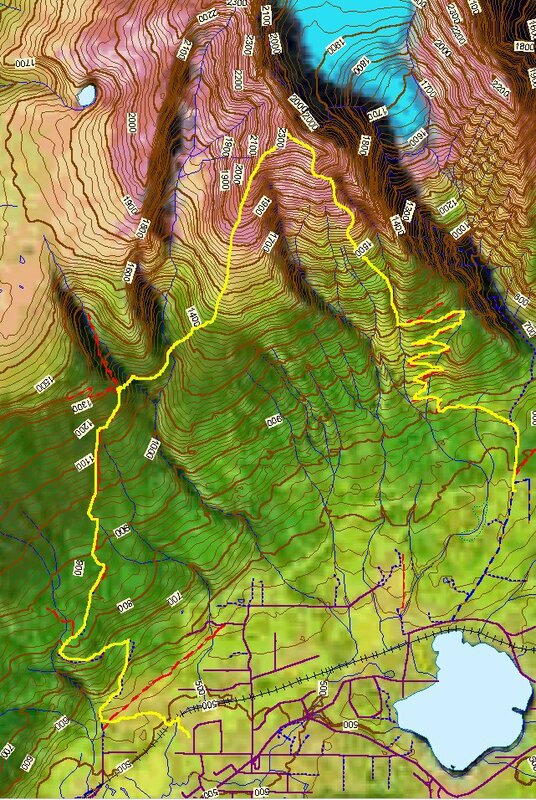 The data is from the on-line BCGS Geology Map at the BC Map Place, but the only layers I have turned on are contour lines, roads, lakes, and a Landsat orthoimage. Contour elevations are in meters, with 100 meter index contours. The scale is 1: 34,000. West is at top. The Landsat image is a short-wave infrared band combination, overlayed on a shaded elevation model. Unvegetated areas show purple, while the glacier shows blue. The yellow line shows a hike that I did in the summer of 2003, using old mining roads to travel between the valley bottom and treeline.